If you are a first-time mother, the term “pregnancy pillow” (also known as “maternity pillow”) may sound foreign to you. For all other expecting mothers, this is definitely not something new, rather, most would say it is something they cannot live without throughout their past pregnancies. 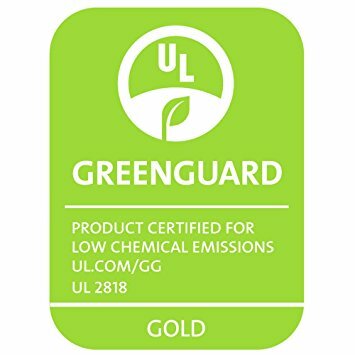 Click on our quick links provided below to help you navigate through this review! 1. 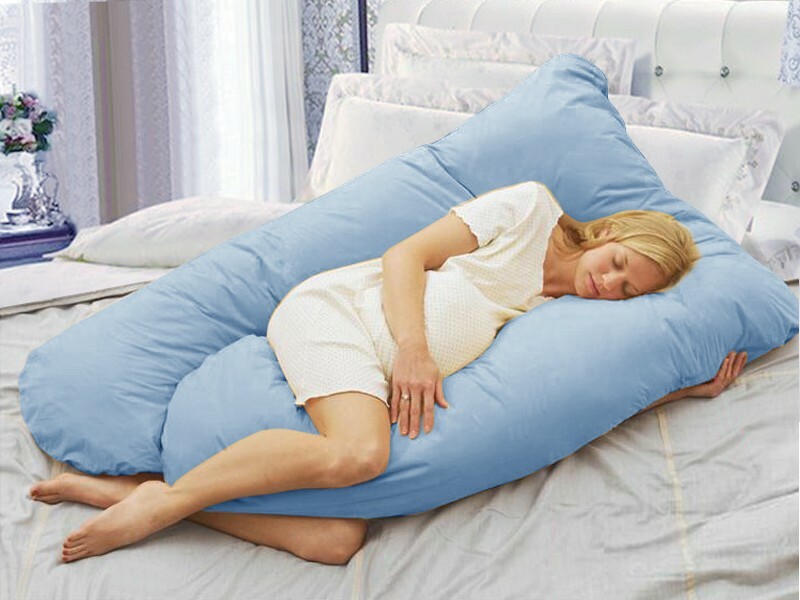 What is a “pregnancy pillow” and why do you need one? B. What sort of fillings? 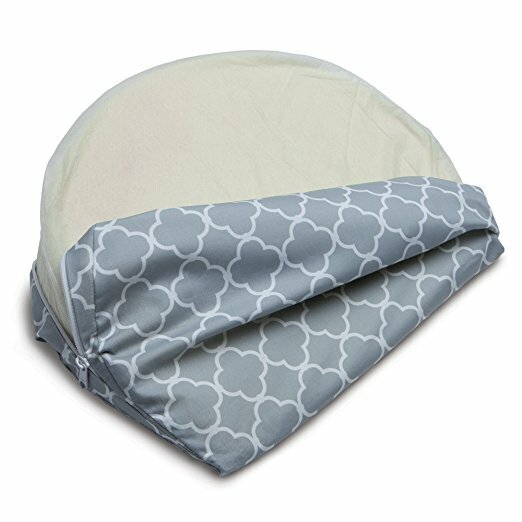 For those that want something small and light, Boppy Pregnancy Wedge Petite Trellis Grey is a great choice. Portable to bring about just anywhere, it serves the same purpose as its other bulkier counterparts. 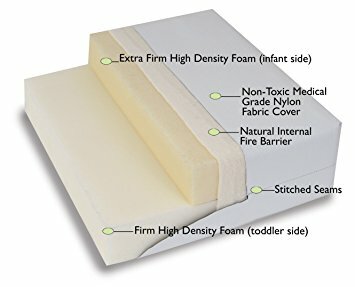 The Snuggle-Pedic Shredded Bamboo Combination Memory Foam Body Pillow with Kool-Flow Cover provides flexibility in that you can either use it as a long straight pillow or twist it into a shape that fits you perfectly. PharMeDoc Full Body C-Shape Pregnancy Pillow provides bigger support area comparatively and is a great choice for those that suffer aches and pains in more than one area. For those that need complete full body and wraparound support, the Leachco Bavk 'N Belly Chic is your best choice. This is also for those that do not mind their bed space being taken up considerably. 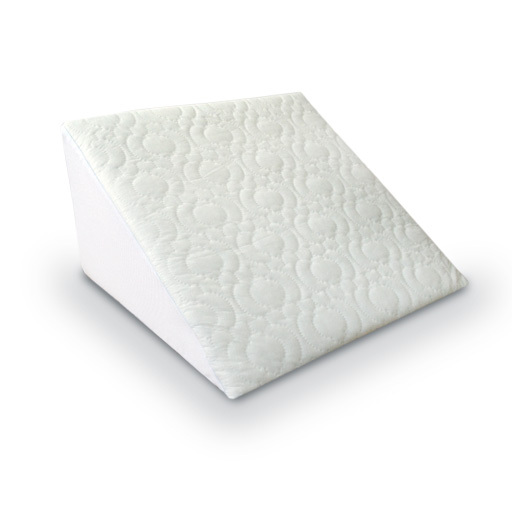 For those that cannot give up sleeping face down, the Earthlite Pregnancy Cushion is a good choice to consider. Read on to find out more about this! A pregnancy pillow is commonly used to help alleviate pain in ankles, knees, belly, back, neck and shoulder that most expecting mothers will, at some stage of their pregnancy, experience at varying degrees (those that do not, lucky you!). A good pregnancy pillow conforms to your new shape correctly and provides you adequate support, something most regular pillows cannot offer. Apart from being a pain relief, pregnancy pillows also serve to provide you more comfort and support when you sleep so that you can achieve optimum rest. 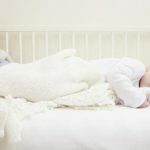 Many would have to change their sleeping position as a result of their growing belly (you cannot sleep on your stomach anymore, but if this is a real struggle, read on to find out how you can still do so below. Oh rejoice!). It is also not advisable to lay flat on your back for long hours while you are pregnant, so you would need to change to sleep on your side. This means you will not have any support on your back, and most would agree that this causes enormous discomfort, if not pain. With a pregnancy pillow, you can have adequate support on your back (and everywhere else – read on to find out more), thus preventing you from turning around. Changing your sleeping position can take some time to get used to, with much tosses and turns each night before you can eventually fall sleep, and this is when a pregnancy pillow comes in handy. Your partner will certainly thank you for that! Now, before you rush out to buy this wonderful item, here are a few tips and guides you should know in order to choose the best pregnancy pillow that suits you most! There are several factors to consider in order to find the best pregnancy pillow for you - Size, Shape, Material (Fillings), Flexibility etc. To start off, let’s examine the types of pregnancy pillows available in the market. There are many types of pregnancy pillows but we can safely narrow them down into two categories – Wedge and Full/All Body. As you can tell from its name and the pictures shown above, a Wedge pregnancy pillow is a pillow for you to ‘wedge’ in areas that you want to. 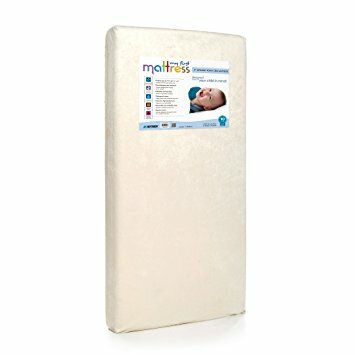 Belly feels heavy and uncomfortable when you are sleeping on your side? Wedge it underneath your belly for instant support! Lower back feels painful? Wedge it at your back! Suffering from heartburn/reflux? Wedge it under your neck! We are sure you get the gist now of how a Wedge pregnancy pillow works. You can even prop your legs up against it to increase blood circulation on your legs and feet to relieve them from swelling and other problems. The best part? 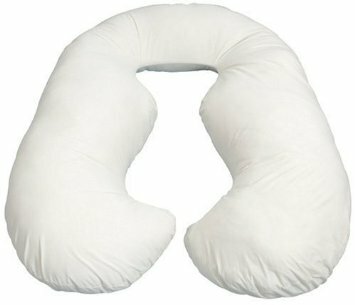 Due to its comparatively small size, a Wedge pregnancy pillow will not take up much space on your bed and you can even bring it with you when you travel. 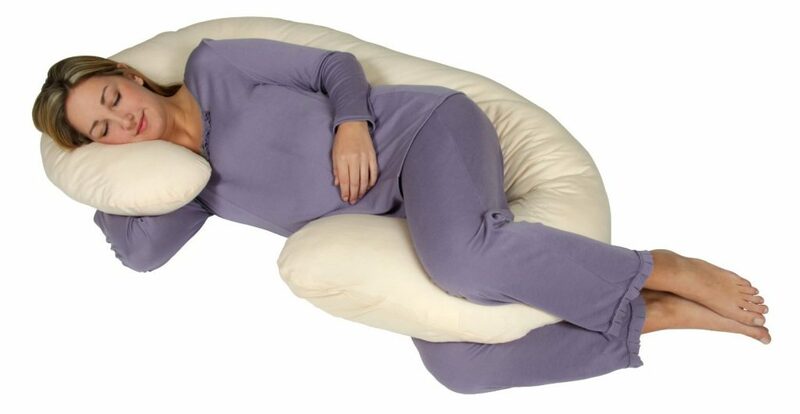 Also, it is comparatively cheaper than its counterpart – the Full/All Body pregnancy pillow, which we are now going into details below. 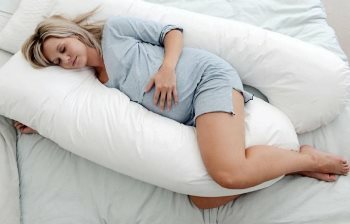 A full/all body pregnancy pillow is much bigger in size (usually 5-6 feet long) and it encompasses your whole body. 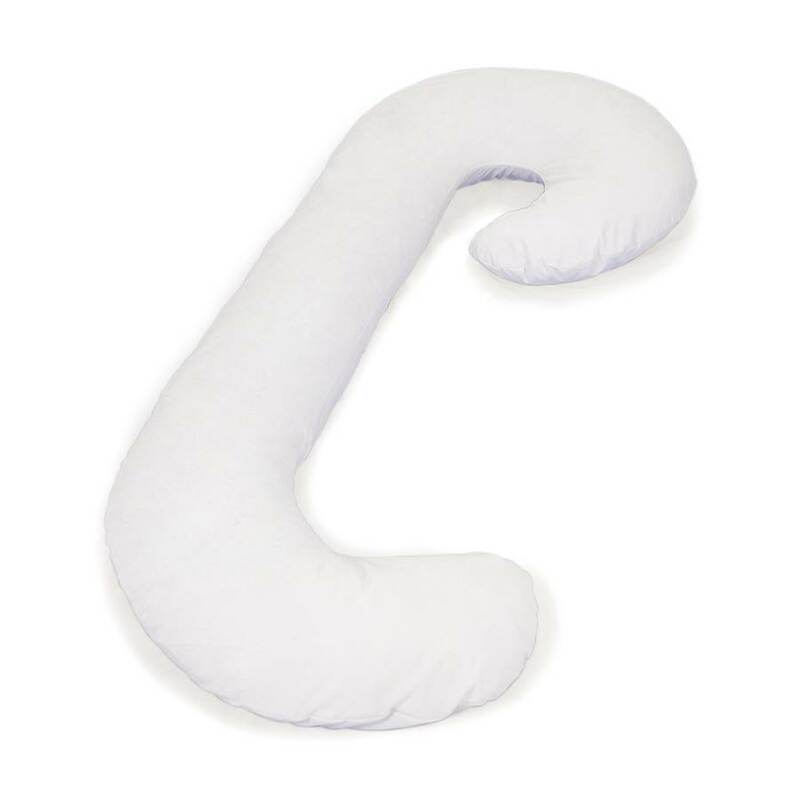 Compare to the Wedge, there are more varieties as to the shape for this type of pregnancy pillow, such as the Full Length (straight or flexible), the C-shape (some calls it J- shape) and the U-shape. The straight pregnancy pillow, unlike its flexible counterpart, is non-flexible, meaning you cannot bend or twist to shape it alongside your body. Both straight and flexible pregnancy pillows are best for side sleepers/huggers/cuddlers as they are meant to be hugged when one sleeps. The difference between a regular pillow and the full length pillows is that the latter allow you to wrap your arms and legs around it as a whole (see picture below) compare to needing several (which will move around as they are not intact to one another) of the former to achieve a similar effect, while at the same time providing your belly adequate support and comfort. Also, you will not need a separate pillow for your head anymore as the full length caters to that as well. 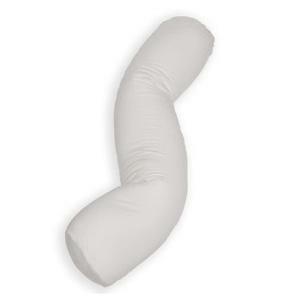 The downside of this pregnancy pillow shape is that it is not ideal for back sleepers. The picture below best illustrates how a C-Shape (or J-shape, depending how curved the head part is) works. The bottom curve of the pillow goes in between your legs while the whole of your back is fully supported and your head rest on the top curve. 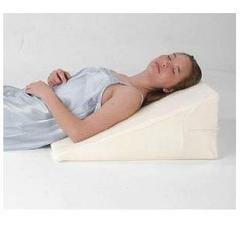 This pillow is ideal for back-sleepers, however, the downside is there is no, or very less (again, depending on the curves of the pillow) support, on your belly as there will be a gap between the curves. This may not be a problem if your belly is not very big, otherwise, the U-Shape may be a more suitable choice. Easily claiming the spot to be the most popular shape that mothers love, and it is not hard to see why, the U-Shape pregnancy pillow provides superior support as it wraps around one’s body fully. Similar to the C-Shape where support is provided at your head, back and legs, the U-shape pregnancy pillow also provide adequate support to your belly. It wraps you around giving you full and all-round support both at your back and your front simultaneously. This is unlike the C-Shape, where there will be a gap (big or small, depending on the brand) between your belly and legs. 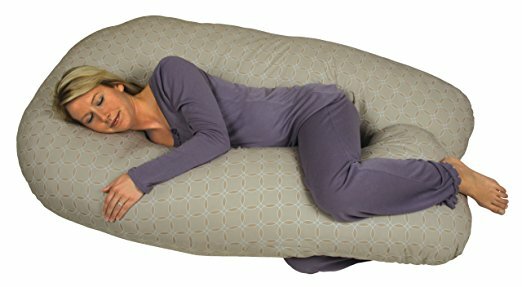 The downside of this wonderful pregnancy pillow is undoubtedly its big and bulky size (the biggest type out of all pregnancy pillows – you do need to consider how big your bed is, otherwise, it’s likely your partner will have to sleep in another room), as well as its price which is the most expensive out of all types. You may now have, in your mind, chosen the type of pregnancy pillow you want, but here’s another question to consider – what fillings should you look for? Think beanbags. 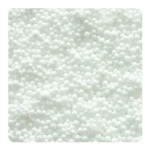 Styrofoam balls are the fillings used for beanbags and they are generally the cheapest of all. Because of this, Styrofoam-filled pregnancy pillows are the most affordable out of all but bear in mind that they do make rustling noises when you move around. This is perhaps the most popular and budget-friendly filling. It is non-allergic and can be washed regularly. 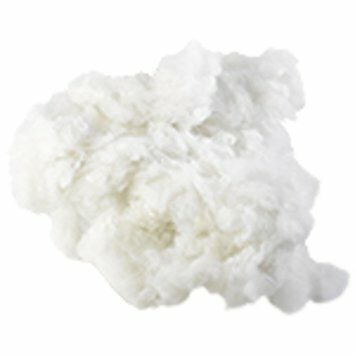 Polyester fibre fillings are soft and do not make any noise. Due to its popularity, it is easy to find polyester fibre pregnancy pillows and you may even find some polyester/cotton blend which gives added firmness. 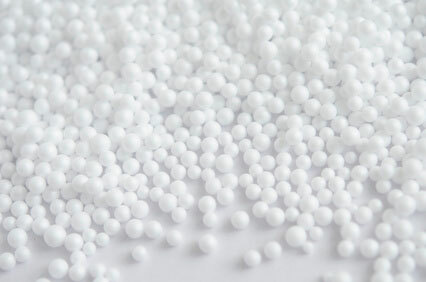 Microbeads look like Styrofoam beads except that they are much, much smaller. Manufactured to be almost perfectly uniformed, these tiny beads will move around easily to conform to your shape and give support to where you want. 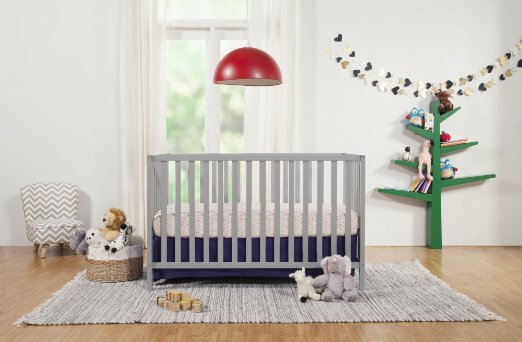 Due to this nature, they provide one of the best supports for pregnancy pillows and its lightweight and almost no noise make microbeads a well-loved filling amongst mothers. 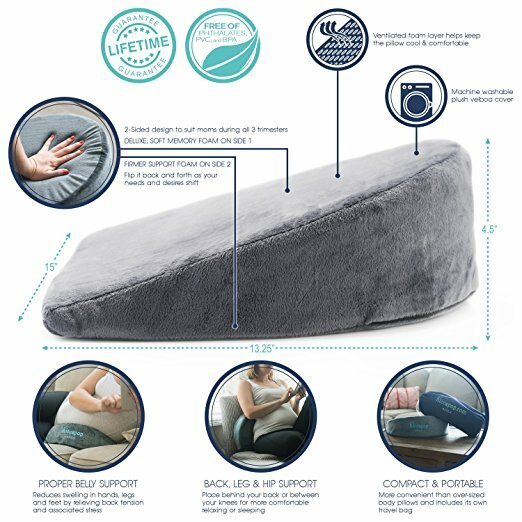 The most expensive filling out of all, memory foam pregnancy pillows take your shape when you lie on it and return to its original shape when your weight leaves it. They can be quite thick but most are treated to allow better air circulation so as to release heat that tends to get trapped in the foam. We thought we’d do things a bit differently this time around, considering different expecting mothers have differing needs which can be targeted by different pregnancy pillow types. So rather than meshing both Wedge and Full/All Body Pregnancy Pillow into a list of Best Pregnancy Pillow, we are going to provide you the best maternity pillow in each type and category. Without further ado, let’s go! 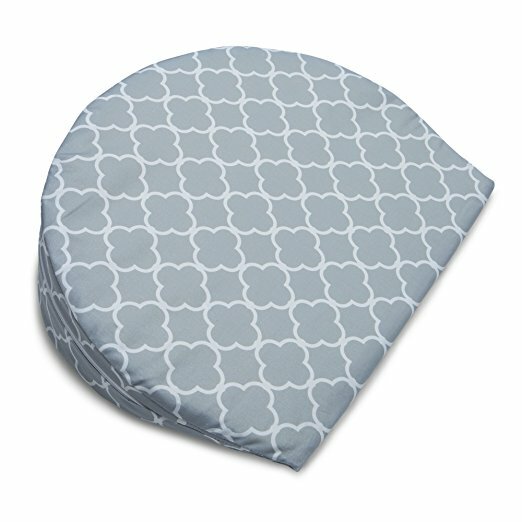 Hands down the best pregnancy wedge pillow in the market! First off, it comes with an unbeatable price. 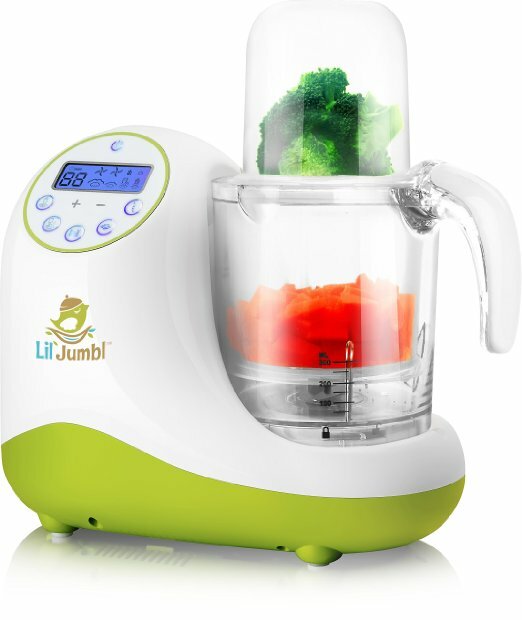 Some may be sceptical about its quality given its affordable price, but we are pleased to announce that all your fears are dismissed after we have reviewed this wonderful item. 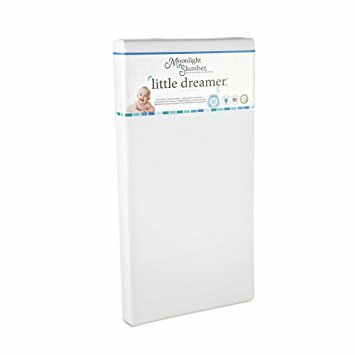 Weighing at just 3.2 ounces and made from polyurethane foam, this wedge pregnancy pillow is petite and light enough to be brought around just about anywhere. It has the right height and angle that fits most women and many love that it is not too hard or too soft but still provides a firm support and does not move around. 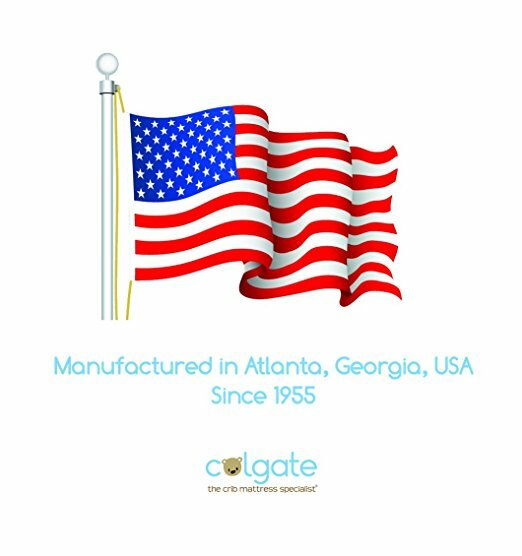 It comes with a soft, pima cotton slipcover with zips which you can easily remove and wash in the machine for hygienic purpose. 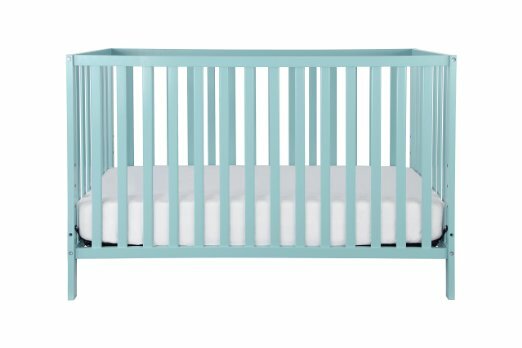 The Boppy Petite Trellis can be slipped between your legs, rest underneath your belly or placed at your back for adequate support. 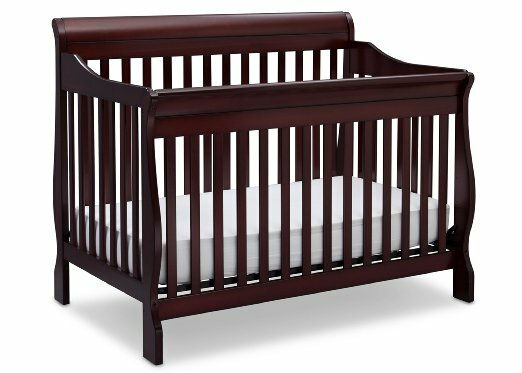 Due to its flexibility, the Boppy Petite Trellis is regarded as one of the best pregnancy pillow for side sleepers as well as back sleepers. 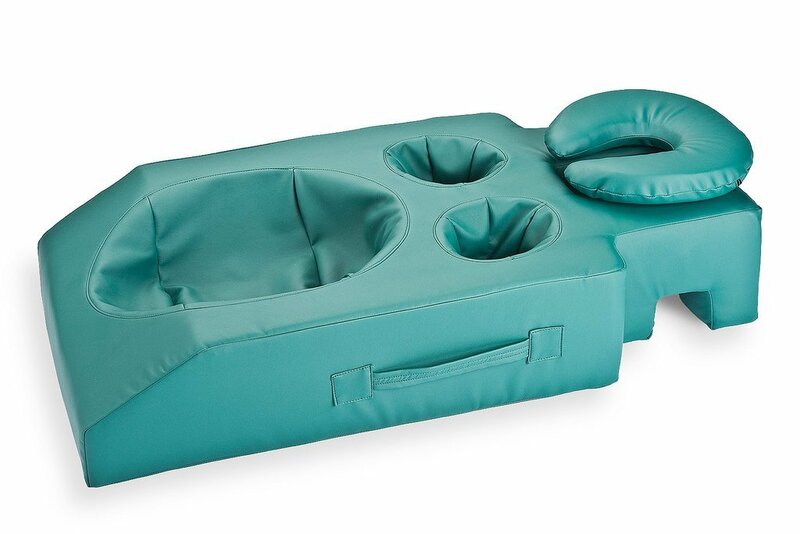 You can even move it to your couch and prop it at your back while you are sitting for optimum comfort. In fact, many confess that they continue using it even after their baby is born, such as propping their heads up to read a book or using it as a breastfeeding aid, or simply using it as a body pillow for back support. 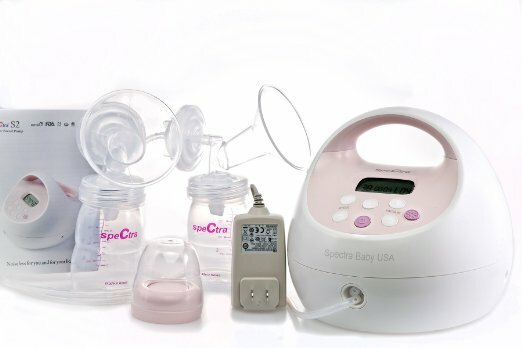 In fact, even your newborn baby can utilise it too as mothers have use it to prop their babies’ head up to stop reflux. The only downside, which may not be existent for most of you, is that it can be a tad too small for women in comparatively larger in size. Fret not though, for we have an alternative for you. 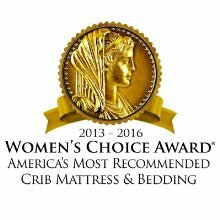 Truly value to money, the Boppy Petite Trellis is a purchase you will not regret so think no further if you decide to get a wedge pregnancy pillow (which many would agree it to be the best rated pregnancy pillow type of all times)! 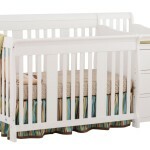 This is similar in quality to that of the Boppy Petite Trellis, but it comes in a slightly bigger size. 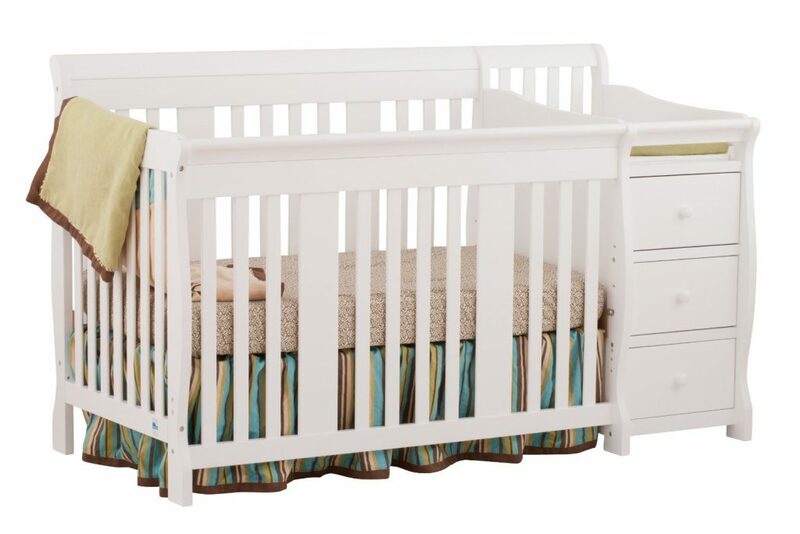 Don’t worry, it is not too big to the extent that your bed space will be compromised, but rather it has a slightly bigger base with a taller angle. You will still be able to bring it around the house i.e. prop yourself up while sitting on the couch. 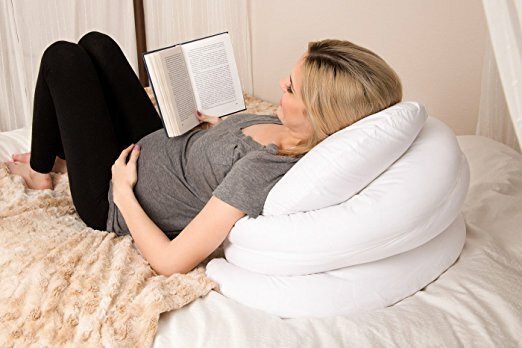 Many has said that this pregnancy pillow has increased their quality of sleep in that not only do they sleep through the night, they do not feel any pain or discomfort when getting up from the bed as opposed to when they were not using this pillow. 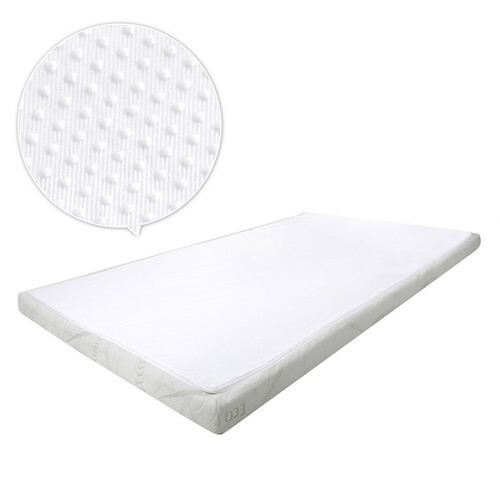 Its dual-sided (one side softer, the other firmer) memory foam provides firm support while not being too hard on the belly, and as your needs change alongside your pregnancy, you can simply flip the sides over to suit your needs. 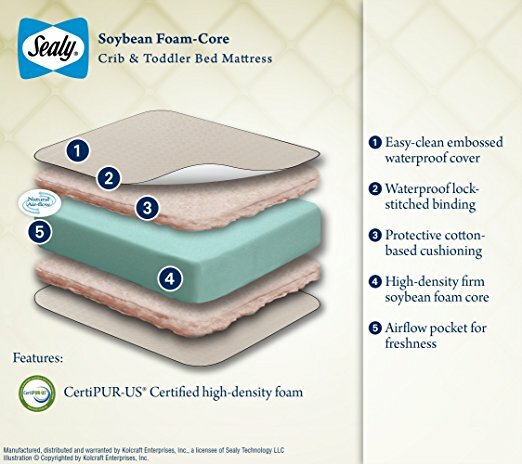 The tiny, perforated holes throughout the pillow allow better airflow and reduce moisture build-up, hence controlling the temperature so that it does not get uncomfortably hot. 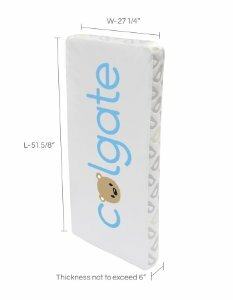 It comes with a removable washable pillowcase as well as a travel bag which makes it even more compact and perfect for travelling. 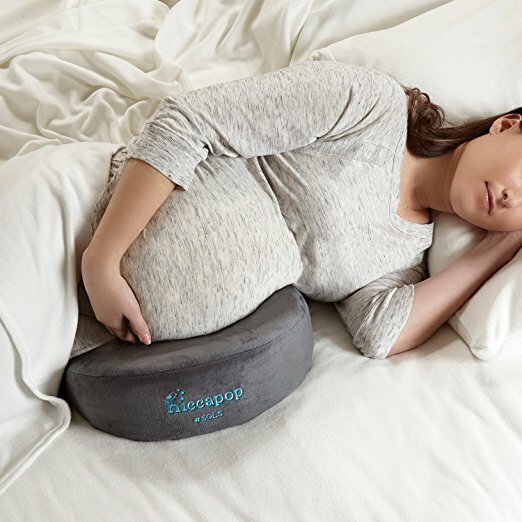 Due to its bigger size and different fillings, the Hiccapop Pregnancy Pillow Wedge is heavier than the Boppy Petite Trellis but if this is not a concern, we would say the Hiccapop Pregnancy Pillow is truly one of the best wedge pillows out there providing the best quality and comfort to pregnant woman. Like the flexible full length pillow we explained above but is afraid that making it straight will not hold long? 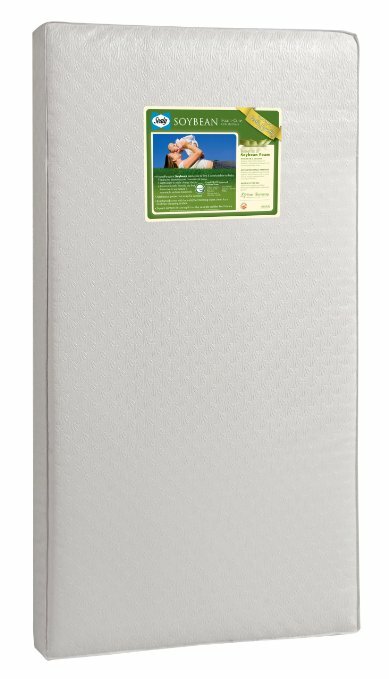 Such worry is unnecessary with the Snuggle-Pedic Shredded Bamboo combination memory foam body pillow. 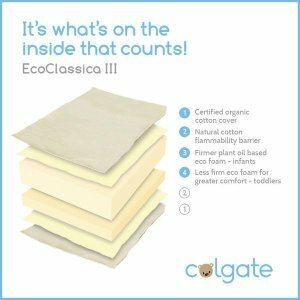 This trademark pillow (both fillings and cases) utilises a mix of their own special hypoallergenic and extremely low V.O.C biogreen memory foam and Certipur- US certified foam. 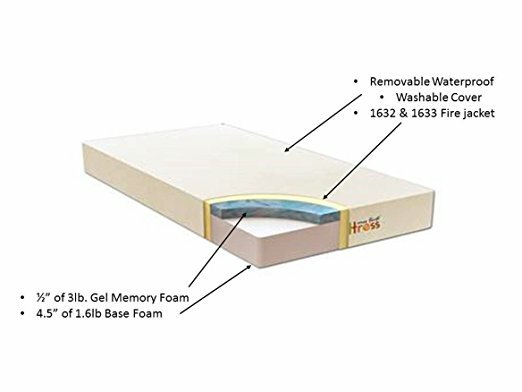 These extremely small pieces of materials are what made the Snuggle-pedic stands out amongst other memory-foam body pillows. 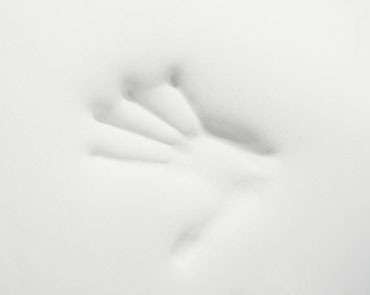 They are extremely soft and fluffy without compromising firmness and resiliency. 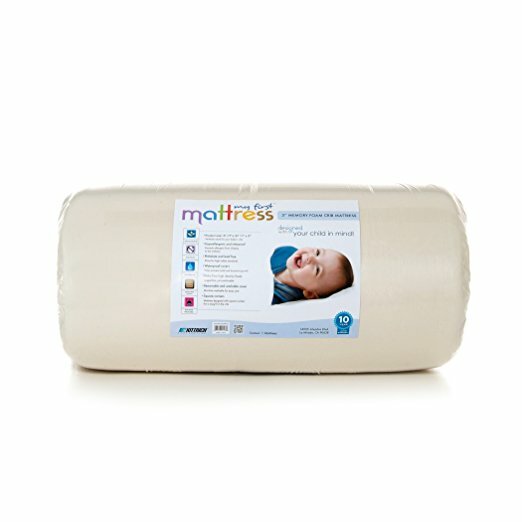 Suitable for the back, belly and legs, you can shape the Snuggle-pedic anyway you want to ease your troubled areas. 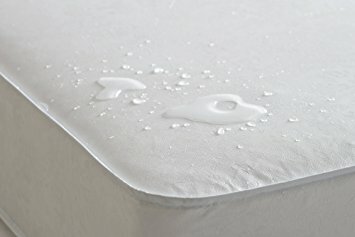 Once shaped to your desire, the Snuggle-pedic holds its shape throughout the night (thanks to the small chunks of memory foam fillings) so that you do not have to reshape it every now and then. You can even lay it on your chair! 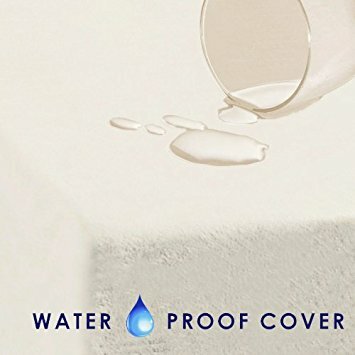 Given its trademark technology, you will be amazed at how softness and firmness can coexist in one single item, providing the right amount of balance. 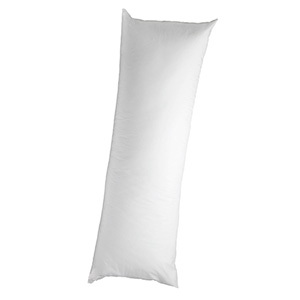 It is no surprise that this is considered the best full body pillow by many. 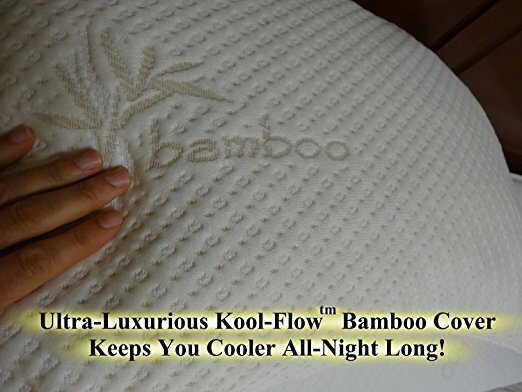 The whole of the Snuggle-pedic is machine-washable, however, to achieve this, the Kool-Flow (another trademark) micro-vented bamboo pillow case is not removable. 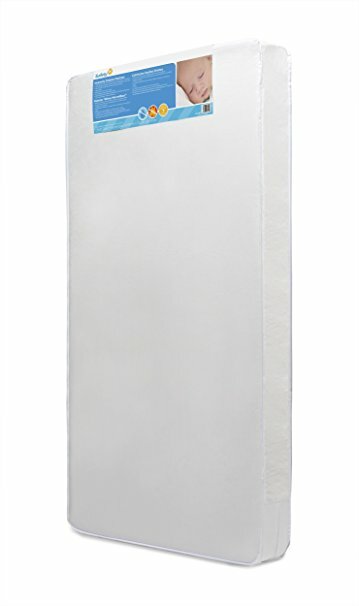 Nonetheless, many have commended this pillow case to be one of the best in terms of air ventilation thus keeping the pillow cool and comfortable. The downside of this amazing product will be its size. Do be prepared that this will take up a significant area of your bed so this is something to take into consideration if you have limited bedspace. Also, this pillow leans towards the pricier side, however, it is definitely justified by its wonderful features and long durability. 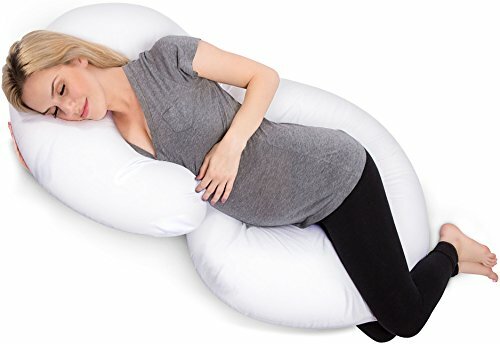 The PharMeDoc Full Body C-Shape pregnancy pillow boasts clever designs that allow several configurations to be made for pregnant women to find their best fit. The unique C-shape design supports and aligns your hips, neck, back and tummy in various positions so as to relieve you from any pregnancy pain or sores. 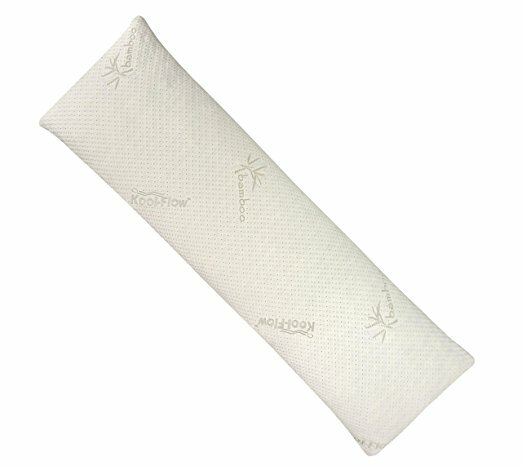 Made from 100% cotton, this pregnancy pillow is firm and does not lose its shape despite the weight put on it. Hypoallergenic, it is zipper removable and machine washable. 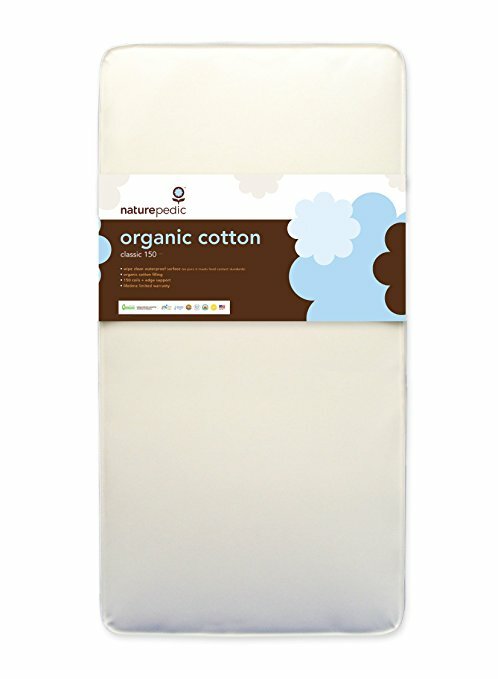 It also comes with a cotton-polyester blend pillowcase which is woven with anti-microbial properties to fight off allergens, thus ensuring a breathable night’s rest. 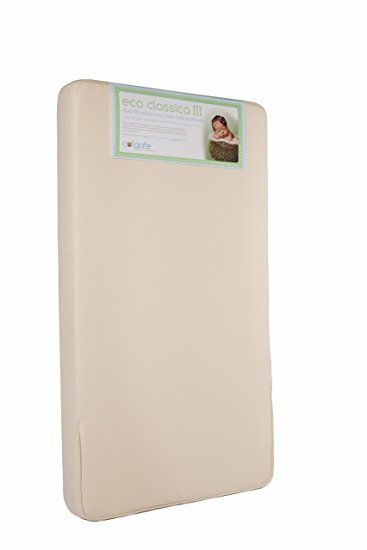 You will have peace of mind that this pillow is latex, lead and BPA-free. As we noted above, C-shape pregnancy pillows do take up bed space and this PharMeDoc is no exception. This can be a downside/inconvenience to some, though if you have a queen size bed or larger, this shouldn’t be much of a problem. Also, if you were on the taller side (say more than 5’11), the PharMeDoc Full Body C-Shape pregnancy pillow may not fully wrap around you so this is something to bear in mind as well. It is not easy to come up with just 1 best U-shape Pregnancy Pillow, but we think most will agree with us that the Leachco Back ‘N Belly Chic takes the cake. As you can probably guess from its name, the Leachco Back ‘N Belly focuses on your growing belly and aching back, while at the same time provide complete and all-around support to your whole body as it envelopes you completely at all sides. The inner contours take in your body shape and blends seamlessly into it, giving you the perfect support without needing much adjustment on your part. It also elevates and aligns itself according to your body into a neutral position which help relieve pain and strain on joint strain. The overlapped ends help with elevation of upper and lower body, as when required. 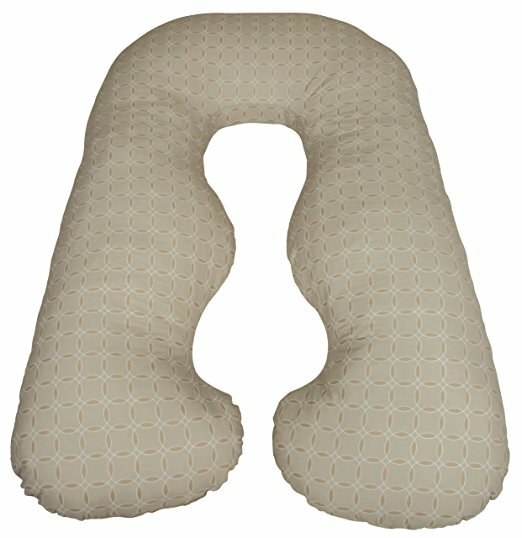 Because of this, it is the best pregnancy pillow for back pain relief. While it is soft and fluffy, it is firm enough and does not go flat under weigh. It holds its shape well and remains fluffy even after long wears. 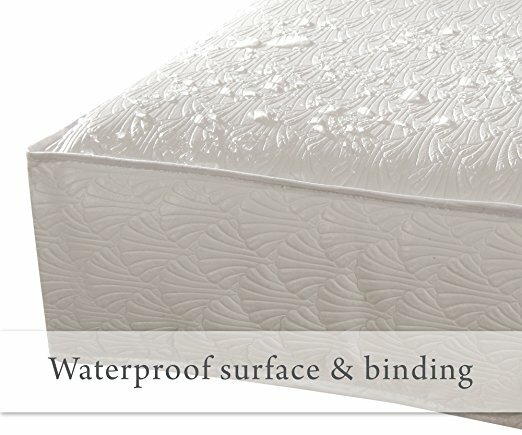 Because of its shape, it allows you to either sleep on your sides or on your back without compromising support in other parts of your body. You will be pleased to know that this comes in a zippered cover which is removable and machine-washable. 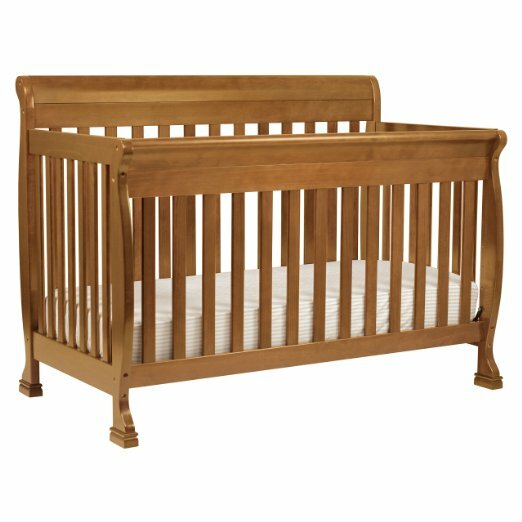 The Leachco Back ‘N Belly is bulky so you have to be prepared to compromise bedspace if you’re getting this. 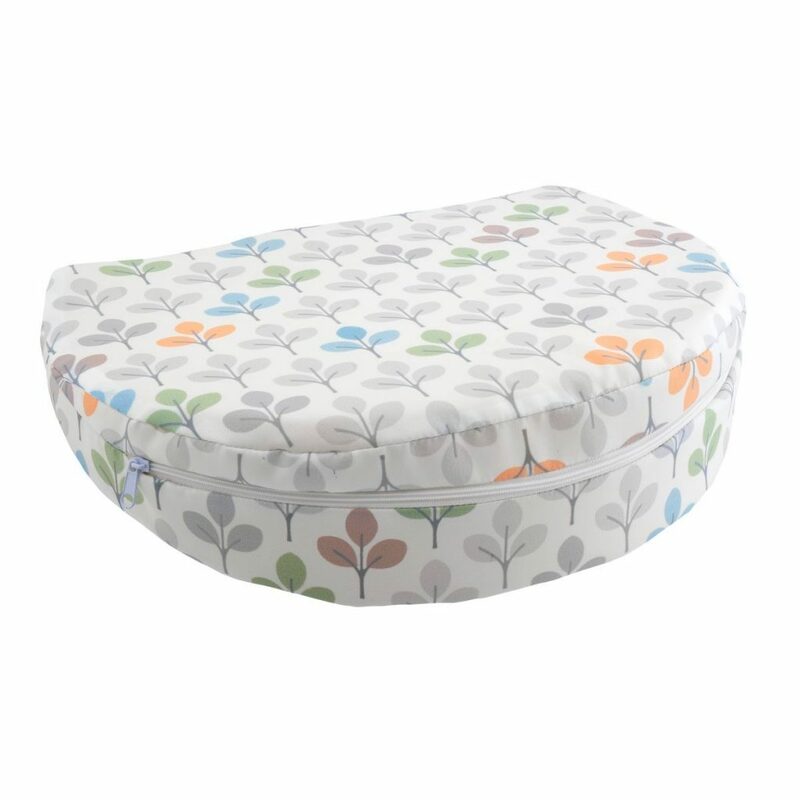 However, this size is recommended if you suffer aches or pains in more than one area, or if you are expecting twins or more as the large size of this pillow can certainly cater to your belly, which will be much larger than other expecting moms. 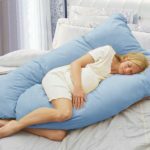 The downside of this, apart from the abovementioned bulky size which is unavoidable in this type of pregnancy pillows, is definitely the price. It is on the high side compare to most other U-shape pregnancy pillow. If price is a concern, you may like to check these out. Otherwise, the Leachco Back ‘N Belly is a worthy investment that will last you a very long time (and several pregnancies!). 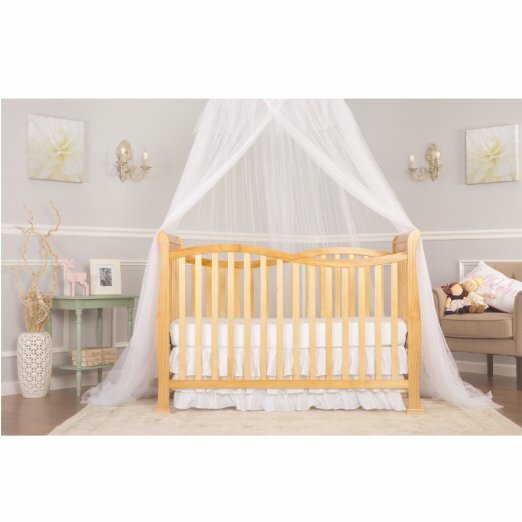 And yes, we haven’t forgotten about our promise above, that is, there is now a solution for all you expecting mothers who insist to sleep face down! Be warned though of its price point, as this is not an everyday use commercial pregnancy pillows we reviewed above. Rather, its targeted customer base is more to the likes of chiropractors, spa professionals or massage therapists, who utilize it for their customers. As seen from its concave shape, you can sleep on your stomach on this one. However, it does require a bit of work (or even external help) to get up and out from this pillow as it is not something where you can just roll out of easily. Given the frequent toilet visits you would need during pregnancy, this is definitely something you should take into consideration. 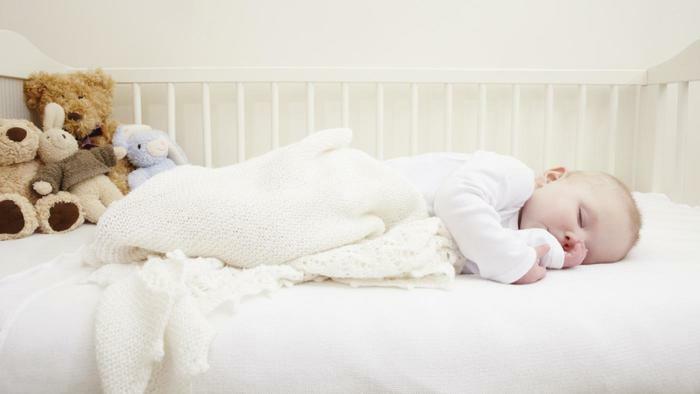 Unless you find it impossible to sleep otherwise, we’d still recommend that you try to change your sleeping position as sleeping face down on your stomach for prolonged period is not a recommended sleeping position for pregnant women. To sum it up, there is no one best pregnancy pillow that fits all, rather, you should consider what support do you require, which part of your body needs pain alleviation, what is your size and what is your budget. As wonderful the U-shape pregnancy pillow is, it is not necessary getting it when your body doesn’t fully utilize the functions it has to offer yet you have to sacrifice precious bed space and pay more money for it when say, a wedge pregnancy pillow will do the trick equally for you. So observe carefully what you need, and think before you buy. Now go and buy your best pregnancy pillow! There is a reason why many say this is one of their best decision/investment made during their pregnancy journey. And it doesn’t stop at there – you can use these pillows even if you are not pregnant for better posture and better sleep quality. Good luck!